The Kaneko Art Gallery hosted a reception honoring the work of artist Unity Lewis on Tuesday. Lewis has been covering the walls of the Kaneko with murals and turning the gallery into a home away from home. Lewis also featured the work of other notable artists such as Parliament-Funkadelic frontman George Clinton and African-American artist Samella Lewis (Lewis’ grandmother). Throughout the event, Lewis met with guests of the gallery and answered whatever questions they had. He also signed autographs for people who bought copies of his CD, “7th Dynasty”. Lewis finished the night by picking up a microphone and turning the Kaneko into an impromptu concert venue by rapping two original songs. When the reception came to an end, Lewis hosted an after party at the Oak Park Brewing Company where members of the art club did live art and ARC student John Klaiber organized an open mic show. 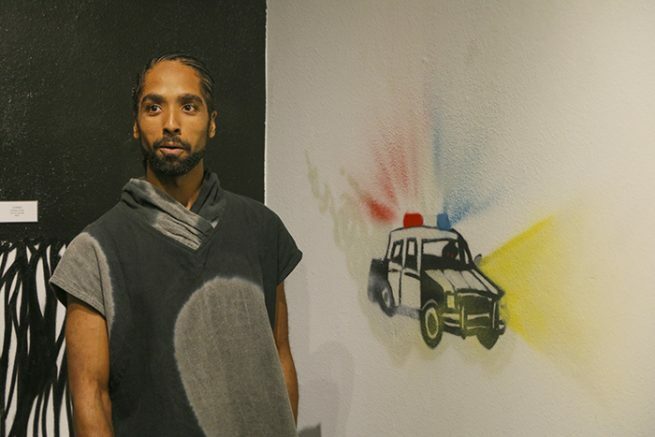 1 Comment on "Kaneko hosts art reception for Unity Lewis"